Again 16 Tamil Nadu Fishermen are arrested by Sri Lankan NAVY and their nets are snapped off. Tamil Nadu fishermen are suffocating with Sri Lankan NAVY over a long time. They are being arrested and harassed by the Sri Lankan NAVY for fishing in their territorial water. It seems the problem between Sri Lankan NAVY and Tamil Nadu Fishermen is everlasting. Today (Jan-16th-2018) , 16 Tamil Nadu fishermen were arrested by the Sri Lankan NAVY again near Kachatheevu. Gopinath, Assistant Director of Fishery Department said, More than 2,500 fishermen from Mandapam and Rameswaram area were sailed in yesterday for fishing near Kachatheevu. The Sri Lankan NAVY personals came to the fishing spot, than snapped off their nets and arrested 16 of them and chased away the remaining fishermen from there. Those 16 men were arrested and taken to the Kangesanthurai of Sri Lankan their boats were also impounded by the navy, said Gopinath, Assit. Director of Fishery Department. 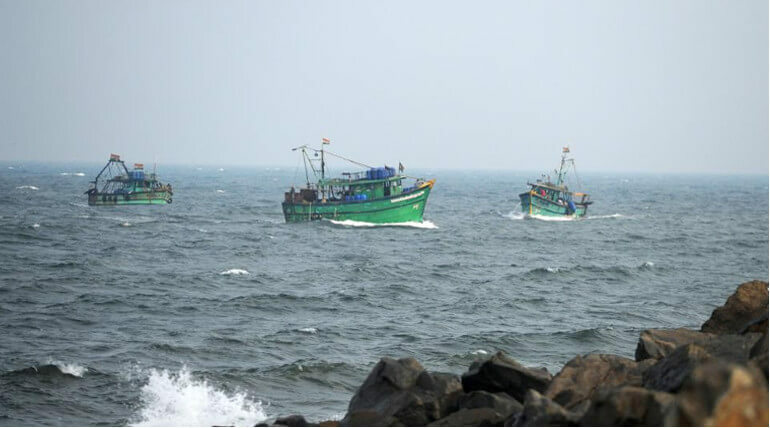 Recently on January 9 more than 3,500 TN fishermen were chased away by the Sri Lankan Navy and some of their boats were damaged near Kachatheevu for fishing allegedly in the Sri Lankan territory of Kachatheevu is to be noted. Rameshwaram Fishermen Association's President, P. Sesuraja had urged the central government to take steps against the frequent arrest of TN fishermen by the Sri Lankan NAVY.